If you don't want to install Google Toolbar to use Sidewiki or if Google Toolbar is not available for your favorite browser (Opera, Safari, Chrome), you can now use a bookmarklet. It doesn't notify you when the current page is annotated and it doesn't open in a persistent sidebar, but it's a decent alternative. 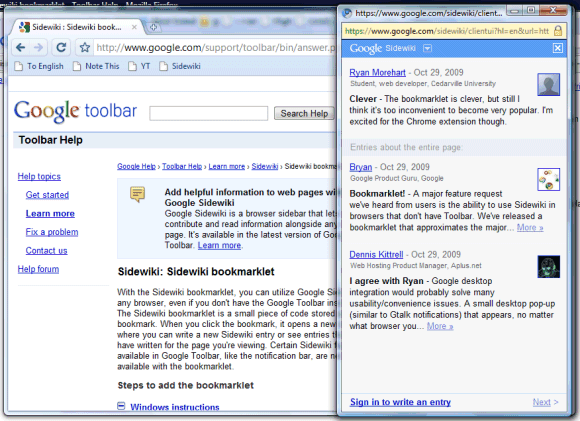 "The bookmarklet is clever, but still I think it's too inconvenient to become very popular," comments Ryan Morehart. The worst thing is that you need to click on the bookmarklet whenever you visit a new page and every time you click on the bookmarklet, it opens a new pop-up window. Google Sidewiki's team says that it works on a Chrome extension that will add more features and it will be better integrated with the browser. Correction: The Sidewiki team, not the Google Chrome team, posted that they are working on an extension. They posted it on the Chrome blog, which is confusing. is it just me or the google home page is different on chrome on karmic? i just see the logo, the search box and "press enter to search". i have to move the mouse for the other elements to appear. A slightly better Firefox extension: https://addons.mozilla.org/en-US/firefox/addon/46311. It shows Sidewiki annotations in a sidebar, but you still need to click on the icon for every page you visit. Wiki ;) The most biggest enyclopedia in the world. And Google Loves wiki very much, because google love the education. I hope google make new tools for growing wiki! Very clever indeed Google. This is similar to what Twitter does, but it's on the left side of the browser.